Clean-Able the Gloucester based Carpet and Upholstery cleaners have just invested in a new Truck mounted steam cleaner called “The Red Bull”. The new Carpet cleaner gives greater power to the cleaning of carpets and lets us do a larger carpet floor area. There is no emptying of cleaning machines in your house sink letting it remove even the most stubborn of stain quickly and easily. The dirty water from cleaning the carpet is sucked away straight back to the van leaving the carpet very slightly damp and reducing drying time significantly. It is a Dual operated truck mount for the Carpet cleaning Company that needs to have a machine that can clean the largest of areas in the quickest amount of time. It is Powered with Kohler 25HP Engine, Roots 4.7 vacuum blower and 2500 PSI Hydro pump. Twin stainless steel heat exchanges give constant supply of 230 degree hot water, and chemical and corrosion proof stainless recovery tank makes the Red Bull an awesome combination of reliability and power. 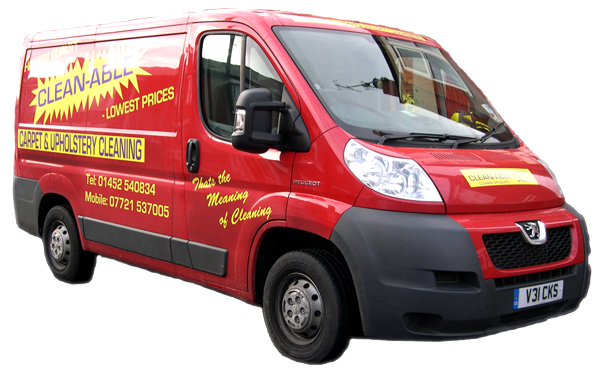 This all round machine gives Clean-Able the edge over other carpet cleaning companies in Gloucester. And with our second to none service makes us the first choice of carpet cleaners in Gloucestershire. Clean-able the premier carpet cleaners in Gloucestershire are proud to announce the launch of their new website.